Many of our everyday behaviors are rhythmic actions, such as walking, breathing and chewing. Networks of neurons called Central Pattern Generators, or CPGs, are in charge of rhythmic behaviors. CPGs send instructions to cells called motor neurons, which in turn tell muscles to contract in a particular sequence to produce rhythmic behaviors. Rhythmic behaviors follow stereotyped patterns: we recognize walking when we see it. But they also vary between individuals: we can recognize the specific gait or ‘walk’ of a friend. Wenning et al. set out to discover where this variability in rhythmic behaviors comes from, using the leech heartbeat system as a model. Leeches have two hearts, or more precisely two heart tubes that run along the entire length of the body, one on either side. The two heart tubes beat with different patterns, but under the direction of the CPGs and motor neurons, they swap patterns with each other every few minutes. The CPG neurons that generate these rhythms, the motor neurons that respond, and the heart muscles themselves, i.e. each level of the system, can all be tracked in leeches. Wenning et al. showed that within each leech, the activity of the CPG neurons, motor neurons and muscles associated with a heart tube varies little. Even when the activity of one of these levels varies less than another, for example between CPG and motor neurons, it is not necessarily reflected in the next level of the system. In some cases, however, variability is seen between opposite sides. Moreover, the rhythmic activity of CPG neurons, motor neurons, and muscle cells in one leech differs greatly from that of another. This likely reflects differences in the genes and life history of the animals. Wenning et al. provide a roadmap for others to use in identifying sources of variability in rhythmic movements. Applying this approach to existing data sets could help tease apart variability in diverse rhythmic behaviors in a variety of animals. Variability across individuals and across cell types in underlying intrinsic and synaptic properties is now viewed as a hallmark of neuronal networks, even those that produce stereotyped output. Indeed, the hunt is on to find the mechanisms and rules that permit constant network output through coordinated regulation, both developmentally and homeostatically, of highly variable membrane and synaptic conductances (Davis, 2013; Marder et al., 2015; O'Leary et al., 2013, 2014; Ransdell et al., 2013; Schulz et al., 2006). But how constant is network output across individuals? Not very seems to be the answer when looking at the literature more closely (e.g., locomotion in mice [Bellardita and Kiehn, 2015] and zebrafish [Masino and Fetcho, 2005; Wiggin et al., 2014]; food processing in crabs [Hamood et al., 2015; Hamood and Marder, 2015; Yarger and Stein, 2015], crawling in fly larvae [Pulver et al., 2015]). The central pattern generating networks of invertebrates have provided some of the best evidence supporting the notion of constant output with underlying variability of conductances (Goaillard et al., 2009; Marder et al., 2015; Prinz et al., 2004; Ransdell et al., 2013). Here phase of firing of component neurons is considered a critical aspect of a functional motor pattern, and phase is by no means constant. Even though it is not correlated with period, phase varies considerably across animals as shown in the stomatogastric nervous system (STNS) and in our work on the leech heartbeat system (Bucher et al., 2005; Norris et al., 2006; Norris et al., 2007b; Wenning et al., 2004a, 2004b). Indeed, we were forced to the conclusion that each animal arrives at a unique solution to producing a functional heartbeat motor pattern; based on phase differences in the premotor pattern and synaptic strength patterns from the central pattern generator (CPG) to motor neurons (Norris et al., 2011; Wright and Calabrese, 2011b). Thus, not only are underlying conductances variable but activity itself is variable and any attempt to elucidate mechanisms of regulation must consider what the target limits for regulation are (‘What is good enough?’; Marder et al., 2006), what are the sources of variability in network output, and how variability at one level in a network influences the variability on another. Here we focus mainly on the latter two questions, having previously established the range of functional output (Norris et al., 2006; Norris et al., 2007a; Norris et al., 2007b; Wenning et al., 2004a; Wenning et al., 2014). 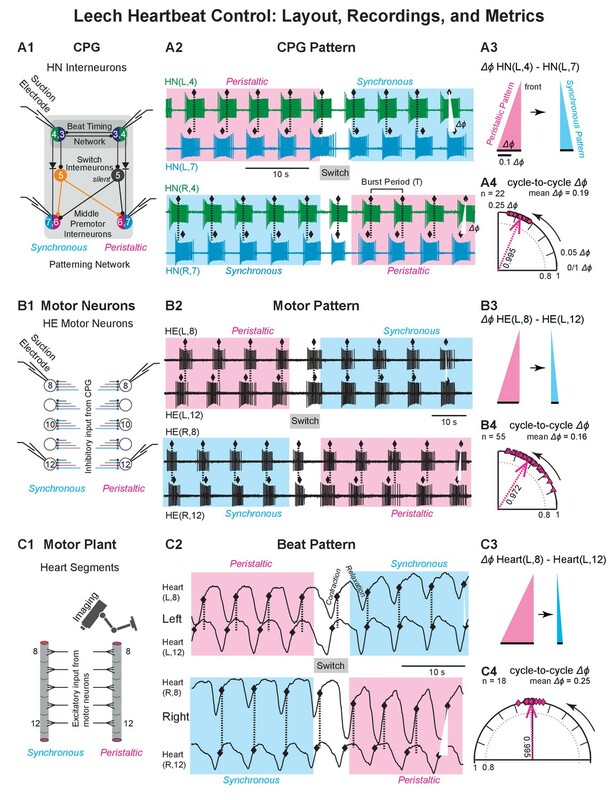 Leech heartbeat presents an amenable system for answering these questions because all relevant neurons of the CPG and motor neurons are identified and easily recorded, and the motor plant (here the hearts) also can be directly monitored (recent review: Calabrese et al., 2016). Moreover, the system is strictly feedforward – CPG to motor neurons, to heart muscle –, its elements are bilaterally symmetrical, it operates without phasic sensory feedback (Calabrese, 1977; Calabrese, 1979), and it has already been demonstrated to be highly variable in output across individuals at each level. A unique aspect to this system is that the coordination of the CPG, motor neurons, and hearts differs at any given time on the two sides – rear-to-front peristaltic versus synchronous – with periodic switches in coordination between sides (Norris et al., 2006; Norris et al., 2007b; Wenning et al., 2004a; Wenning et al., 2014; Figure 1, Figure 1—figure supplement 1 and Figure 1—video 1). Thus, while rhythmic circuit output is continuous, it presents episodic coordination states on each body side. The Leech Heartbeat System switches between two coordination states. Circuit diagram including the bilateral homologous pairs of the relevant heart (HN) interneurons of the core CPG, the heart (HE) motor neurons and the heart tube segments of midbody ganglia 8 to 14. Large colored circles are cell bodies and associated input processes. Cells with similar input and output connections and function share a circle. Lines indicate cell processes, small circles indicate inhibitory chemical synapses, diodes electrical connections. The HN interneurons of ganglia 3 and 4 (HN(R/L,3) and HN(R/L,4) are part of the beat timing network and make mutual inhibitory connections. The HN(R/L,1,2) coordinating interneurons of the timing network are not illustrated for simplicity. Four pairs of premotor HN interneuron (front premotor interneurons: HN(3) and HN(4); middle premotor interneurons HN(6) and HN(7)) make inhibitory connections to all ipsilateral HE motor neurons shown here (HE(8) to HE(14)). The two bilateral heart tubes, which run the length of the animal, form the motor plant. Each individual heart segment is entrained by phasic excitatory input from its ipsilateral segmental HE motor neuron. The entire heartbeat system switches between two coordination states, left rear-to-front peristaltic/right synchronous and vice versa (peristaltic magenta, synchronous blue) about every 70 to 350 s (15 to 60 beat cycles). The two intersegmental coordination states of interneurons, motor neurons and hearts are set up by interactions between the timing network’s front premotor interneurons and the middle premotor interneurons linked by the switch HN interneurons of segment 5 (HN(R/L,5)) and by direct electrical connections. On the synchronous side the switch interneuron HN(5) (ochre) bursts with the beat timing but the HN(5) on the peristaltic side is silent (greyed out). Note that the switch interneurons make bilateral connections to the middle premotor interneurons and that phasing in these CPG premotor interneurons is dominated by the single active switch interneuron. Switches (double-headed vertical arrow) in coordination state occur when the silent switch interneuron starts to burst and the bursting switch interneuron simultaneously becomes silent. The CPG switches between left synchronous/right peristaltic (top) and left peristaltic/right synchronous (bottom) states of coordination. The sources of variability that we considered were (1) inherent variability owing to the stochastic nature of biological processes (analyzing the cycle-to-cycle variabilities within a coordination state episode), (2) repetition variability as the same function is performed multiple times by the same elements (comparing across coordination state episodes), (3) variability within an individual due to differences between genetically identical bilaterally homologous neurons and muscles, and (4) population variability including, but not limited to, genetic variability and variability in individual experience (comparing across animals). We then compare these sources across levels and coordination states. We show that cycle-to-cycle variabilities in phase were low at all levels, in both coordination states, and on both sides. Thus, activity within an individual is precise. We confirm and quantify the large variability in phase across individuals at each level and show that high variability at one level is not necessarily fed forward to the next. In seeking to elucidate the sources of this population variability, we show that repetitions of a coordination state have low variability and thus contribute little. On the other hand, we show that when the same motor act is performed by bilaterally homologous neurons and muscles, variability can be as large as in the population itself depending on the level and coordination. Medicinal leeches have two bilateral heart tubes which run the entire length of the animal (Maranto and Calabrese, 1984a, 1984b; Thompson and Stent, 1976a). Segmental heart (HE) motor neurons innervate the hearts along their length, timing and coordinating their constrictions. The HE motor neurons are controlled by a heartbeat CPG that produces a bilaterally asymmetric activity pattern (Calabrese, 1977). On one side, CPG premotor interneurons fire bursts in a peristaltic rear-to-front progression and in near synchrony on the other. Motor neurons fire correspondingly leading to peristaltic and synchronous motor patterns, in turn leading to an asymmetric beat pattern of the hearts (Wenning et al., 2004a, 2004b). The beat period in leeches is about 4.5 to 11 s, which translates into several thousand heartbeats per day. Embedded in this ongoing activity is the periodic alternation between the two coordinations about every 70–350 s creating episodes of coordination that span 15 to 60 beat cycles. We define a switch cycle of a given side when it has completed both coordinations, one after the other. The core heartbeat CPG consists of 7 bilaterally paired segmental heart interneurons (HN) linked by inhibitory synapses and electrical coupling (Figure 1; review: Calabrese, 2010). Beat timing is determined by the mutually inhibitory bilateral pairs (Right/Left) of interneurons in ganglion 3 (HN(R/L,3)) and ganglion 4 (HN(R/L,4)) linked by coordinating interneurons HN(R/L,1) and HN(R/L,2), which form a beat timing network and ensure bilaterally symmetrical timing (Calabrese, 1977; Calabrese, 1979; Masino and Calabrese, 2002a, 2002b, 2002c). Output to the segmental heart motor neurons, which occur in segments 3 to 18, is provided by inhibitory input from premotor interneurons. Each HE motor neuron makes an excitatory connection to the ipsilateral heart section in its home segment. The HN(R/L,5) interneurons switch the network. 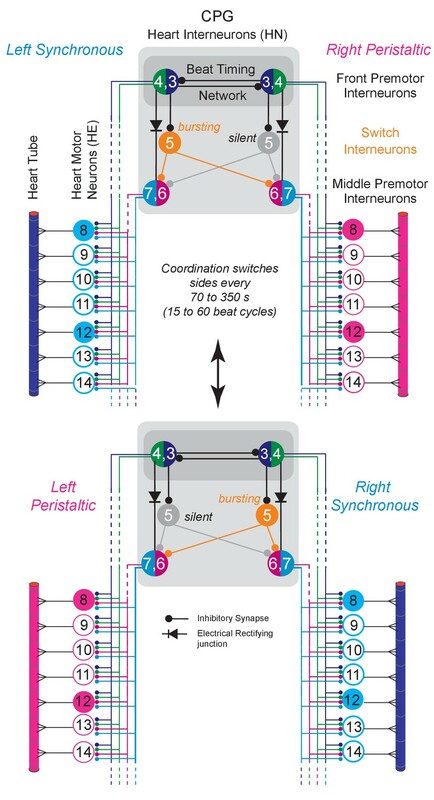 The switch interneuron on the synchronous side bursts with beat timing while the one on the peristaltic side is silent (Calabrese, 1977; Gramoll et al., 1994). Switches in coordination occur when the silent switch interneuron starts to burst and the bursting switch interneuron simultaneously becomes silent. Because the switch interneurons make bilateral connections to the middle premotor interneurons HN(6) and HN(7), phasing in these CPG premotor interneurons is dominated by the single active switch interneuron (Figure 1). In summary, a single CPG consisting of bilateral homologous pairs of HN interneurons produces an asymmetric premotor pattern, motor pattern, and beat pattern that episodically and periodically switches between left synchronous/right peristaltic and left peristaltic/right synchronous states of coordination (Figure 2 A2, B2, C2). Recordings of the CPG pattern, the motor pattern, and the beat pattern. (A1, B1, C1) Recording sites and methods for all levels of the heartbeat control system. (A2, B2, C2) Recordings for all levels of the heartbeat control system. (A3, B3, C3) The base of the triangle represents the intersegmental phase differences (Δϕ) between the front segment and the rear segment in the two coordinations (left side). (A4, B4, C4) Circular phase plots illustrate the cycle-to-cycle variability in peristaltic coordination (left side). The vector length (value next to each vector) was used to calculate the angular variance (s2 = 2(1 r)). Longer vectors indicate less variance. (A1) Suction electrodes were placed on the left and right HN(4) and HN(7) interneurons. (A2) Simultaneous extracellular recordings from these four premotor HN interneurons across a switch in coordination state (top: left heart interneurons; HN(L,4) and HN(L,7); below: right heart interneurons (HN(R,4) and HN(R,7)). Phase marker (♦) is the middle spike in each burst. Dashed lines and white triangles aid in assessing the phase differences between the two interneurons in the two coordinations. Initially, the left side is peristaltic (magenta shaded box) and the right side is synchronous (light blue shaded box). State switches midway. (A3) Colored triangles illustrate the average intersegmental Δϕ (black bars) between the ipsilateral pair of HN interneurons in the peristaltic (magenta) and synchronous (light blue) coordinations of the recording of (A2). (A4) The circular phase plot shows the cycle-to-cycle variability in peristaltic coordination for the recording of (A2). Each circle represents the Δϕ between the two ipsilateral HN interneurons of one burst cycle (n = 22 bursts, mean Δϕ = 0.19). (B1) Suction electrodes were placed on the left and right HE(8) and HN(12) motor neurons. (B2) Simultaneous extracellular recordings from these four heart motor neurons across a switch in coordination state (top, left motor neurons HE(L,8) and HE(L,12); below, right motor neurons (HE(R,8) and HE(R,12)). Phase marker (♦) is the middle spike in each burst. Labeling as in (A2). Initially, the left side is peristaltic and the right side is synchronous. State switches midway. (B3) Labels as in (A3). (B4) The circular phase plot shows the cycle-to-cycle variability in peristaltic coordination for the recording of (B2). Each triangle represents the Δϕ between the two ipsilateral heart motor neurons for one burst cycle (n = 55 bursts, mean Δϕ = 0.16). Labeling as in (A4). Phase scale bars as in (A3). (C1) Video imaging of intact animals yielded optical signals to extract the constriction/relaxation cycles for both hearts in multiple segments. (C2) The beat cycles of two bilateral pairs of heart segments are shown across a switch in coordination state (top: Heart (L,8) and Heart (L,12); below: Heart (R,8) and Heart (R,12)). Phase marker (♦) is the maximum rate of rise (MRR) during the constriction (Wenning et al., 2014). Initially, the left side is peristaltic and the right side is synchronous. State switches midway. (C3) Labels as in (A3). (C4) The circular phase plot shows the cycle-to-cycle variability in peristaltic coordination for the video recording of (C2). Each diamond represents the Δϕ between the two ipsilateral heart segments for one beat cycle (n = 18 beats, mean Δϕ = 0.25). Labeling as in (A4) Phase scale bars as in (A3). Data from the animal shown in Figure 1—video 1. Animal Groups: Bilateral Recordings (Figure 2—figure supplement 1C) and Intact Animal Database (Figure 2—figure supplement 1D). For this study, we focused on segments 8 to 14, because here each HE motor neuron receives input from all four ipsilateral front and middle premotor HN interneurons (HN(3), HN(4), (HN(6), HN(7) (Figure 1; Norris et al., 2007a, 2007b; Thompson and Stent, 1976a). In segments 3 to 6 and 15 to 18 the HE motor neurons receive input from additional HNs (Norris et al., 2007a; Wenning et al., 2011). We collected data from three levels (CPG, motor neurons, and motor plant) and from the two coordinations on the two body sides resulting in 12 scenarios (3 × 2 × 2 = 12). The Project Database, illustrated in Figure 2—figure supplement 1A–D, was compiled since 2008 and partially reported (Norris et al., 2011; Wenning et al., 2014; Wright and Calabrese, 2011a), but all Bilateral Recordings and all analysis are novel. For the sake of clarity, we report and discuss the data, and present the figures, on all three levels for one coordination (peristaltic) and for one body side (left; except when discussing bilateral variability). All data (left and right side, both coordinations) accompany the relevant Figures as source data (in table format). There were no differences in the main conclusions for the right body side. Differences in the data for synchronous vs. peristaltic coordination are pointed out and discussed. All N’s reported represent the number of different animals recorded. We focused on phase, which is a critical output characteristic of any coordinated motor program and its underlying neuronal circuitry. Phase and period do not correlate in the CPG pattern or in the motor pattern across animals in our Project Database (N = 153; data not shown) or in the beat patterns of both adult and juvenile leeches (Wenning et al., 2004a, 2004b). The phase difference between the activity phases of two segments (Δϕ) is a good metric for characterizing the two coordination states (Norris et al., 2006; Norris et al., 2007a; Norris et al., 2007b; Norris et al., 2011; Wenning et al., 2004a; Wenning et al., 2004b; Wright and Calabrese, 2011b). For the CPG pattern, we recorded from two pairs of heart interneurons – HN(L/R,4) and HN(L/R,7) – (Figure 2A1), for the motor pattern we recorded from two pairs of motor neurons – HE(L/R,8) and the HE(L/R,12) – (Figure 2B1), and for the beat pattern, we extracted the digitized optical signals for heart (L/R,8) and heart (L/R,12) (Wenning et al., 2014); Figure 2C1). All sample recordings (Figure 2A2, B2, C2) start with the left side in peristaltic coordination (rear-to-front delay) and the right in synchronous coordination. In the CPG, the HN(L,7) interneuron bursts lead those of the HN(L,4) interneuron, while the HN(R,4) interneuron slightly leads the HN(R,7) interneuron. Similarly, the HE(L,12) motor neuron bursts lead those of the HE(L,8) motor neuron while the HE(R,8) motor neuron bursts slightly lead those of the HE(R,12) motor neuron. Finally, heart (L,12) starts to constrict before heart (L,8) while the right side is in synchronous coordination with the hearts (R,12) and (R,8) constricting almost synchronously. Figure 1—figure supplement 1 and Figure 1—video 1 show the beat pattern for this preparation. In all recordings, the two sides switch coordinations simultaneously to left synchronous/right peristaltic (Figure 2A2, B2, C2). The triangles of Figure 2A3, B3and C3 show the average Δϕ between the left front and rear segment of one switch cycle, i.e. between the HN(L,4) and HN(L,7) interneurons (Figure 2A3), between the HE(L,8) and HE(L,12) motor neurons (Figure 2B3), and between heart (L,8) and heart (L,12) (Figure 2C3). The circular phase plots of Figure 2A4, B4, C4 illustrate the cycle-to-cycle variability for all cycles in peristaltic coordination. Each bout of behavior, either peristaltic or synchronous, has between 15 and 60 neuronal bursts (CPG pattern, motor pattern) and rhythmic constrictions (beat pattern). How variable are the patterns across the bursts or beats within one bout of behavior? Figure 2 illustrates the individual Δϕ between two segments of these individual bursts and constrictions, referred to as cycle-to-cycle variability, and their variance, for a single preparation for the CPG pattern (A4), the motor pattern (B4), and for the beat pattern (C4). Figure 3A shows the variances for all preparations used in this study for two subsequent switch cycles. Cycle-to-cycle variances of the output patterns were equally low on the two sides, in both coordinations, and on all levels (Figure 3—source data 1). But what does ‘low’ mean? We reasoned that the timing network had the lowest variabilities in the heartbeat system. In the same 26 animals where we recorded the CPG pattern (Figure 2—figure supplement 1D) we calculated the cycle-to-cycle variances of the phase difference between the two HN(4) interneurons, which are part of the timing network and which form a half-center oscillator with strong mutual, inhibitory connections (Figure 1; Calabrese, 1977; Hill et al., 2001; Sorensen et al., 2004). The average cycle-to-cycle variance of the Δϕ between the two HN(4) interneurons was similar to the average cycle-to-cycle variances of the Δϕ between two premotor interneurons, two motor neurons, and two heart segments (Figure 3A). In these same recordings, we assessed period variability and found the coefficient of variation to be on average of less than 5% (Figure 3B). Variability within animals: cycle-to-cycle and period variability across individuals. (A) The angular variance s2 of intersegmental phase differences for all bursts (CPG, motor neurons) and beats (hearts) are plotted for two subsequent switch cycles for the CPG pattern (green circles), the motor pattern (aqua triangles), and the beat pattern (red diamonds) within side (left) and coordination (peristaltic). Each symbol represents one preparation. The number of preparations is indicated for each level. Colored symbols: switch cycle 1; grey symbols: switch cycle 2. The angular variance is also shown for one switch cycle for the timing network of the CPG (side-to-side phase difference between the left and the right HN(4) interneurons; dark green circles). Note the low variability on all levels. Number of cycles per switch cycle (n’s) were 7 to 58 (CPG), 14 to 68 (Motor Pattern), and 7 to 31 (Beat Pattern). (B) Period variability of the timing network is shown as the coefficient of variation for the 26 preparations of switch cycle 1. Black symbols represent the preparations shown in Figure 2. Means ± SD are shown next to each group as horizontal and vertical bars, respectively. Animal Groups: Bilateral Recordings (Figure 2—figure supplement 1C) and Intact Animal Database (Figure 2—figure supplement 1D). The low cycle-to-cycle variability indicates a highly coordinated and precise motor system and allowed us to use the average Δϕ of a given coordination in an individual to assess the population, repetition, and bilateral variability. We plotted the average Δϕ between two segments as detailed above in circular phase plots using the animals of this study (Figure 2—figure supplement 1D and Figure 4), for the Project Database (Figure 2—figure supplement 1A and Figure 5A), and for the Simultaneous Recordings from the HN and HE neurons (Figure 2—figure supplement 1B and Figure 5B). Intersegmental phase variability across animals. (A) Population variances were calculated using the average intersegmental Δϕ of all bursts or beats in a single switch cycle per animal (peristaltic, left side). (B) Circular plots show the population variability for each level (color code Figure 3). Each thin arrow represents the average intersegmental Δϕ of one preparation and its length represents the angular variance of the cycle-to-cycle variability of that animal. Each thick arrow represents the average intersegmental Δϕ across preparations (values indicated for each level), its length is inversely proportional to the angular variance (vector lengths given inside the circles), and the black arc is the angular standard deviation. Note that the average intersegmental Δϕ is smaller for the motor pattern than for the CPG pattern. The number of preparations (N’s) and the mean (±SD) intersegmental Δϕ is indicated for each level. Black arrows are the vectors of the preparations shown in Figure 1 (their cycle-to-cycle variances are shown as black symbols in Figure 4). (C) Angular variances are similar for all patterns (colored horizontal bars). The confidence intervals (95%) of 10,000 bootstrapped populations overlap across levels (vertical lines). Animal Groups: Bilateral Recordings (Figure 2—figure supplement 1C) and Intact Animal Database (Figure 2—figure supplement 1D). Population variability across two larger populations. Population variances for the Project Database (Top) and for the Simultaneous Recordings from the HN interneurons and HE motor neurons (Bottom). (A) Variances across all preparations in the Project Database (Figure 2—figure supplement 1A). Each symbol on the circular phase plots represents the average intersegmental Δϕ of one preparation in one switch cycle. The number of preparations and the mean intersegmental Δϕ (±SD) is indicated for the CPG pattern (N = 129; circles) and of the motor pattern (N = 83, triangles) for peristaltic (magenta) and synchronous (blue) coordination. Thick arrows represent the average intersegmental Δϕ across preparations (values indicated for each level), their length the angular variance (values inside each circle), and the black arcs the angular standard deviation. Note that the intersegmental Δϕ of the CPG pattern is larger than that of the motor pattern (peristaltic: p<0.001, synchronous: p<0.001, unpaired t-test). (B) Angular variances and the confidence intervals of 10,000 bootstrapped populations (vertical lines) for the CPG pattern and the motor pattern. Note that confidence intervals (95%) do not overlap in the peristaltic coordination. (C) Variances across all Simultaneous Recordings (Figure 2—figure supplement 1B). Each symbol on the circular phase plot represents the average Δϕ of a preparation in which HN interneurons and HE motor neurons were simultaneously recorded. Layout, symbols and colors as in (A). Note that the average intersegmental Δϕ of the CPG pattern is larger than that of the motor pattern (peristaltic: p<0.001, synchronous: p<0.001, paired t-test). (D) Angular variances and their confidence intervals are shown for the CPG pattern and the motor pattern. Note that confidence intervals (95%) do not overlap in peristaltic coordination. Color code and labels as in (B). We had shown previously that the average Δϕ differences between the front and middle premotor HN interneurons (HN(4) and HN(7)) were larger than those between the HE(8) and the HE(12) motor neurons (Wright and Calabrese, 2011a). We obtained the same results in three data sets: (1) Bilateral Recordings, Figure 2—figure supplement 1C and Figure 4B: unpaired t-test, p<0.001; (2) Project Database, Figure 2—figure supplement 1A and Figure 5A: unpaired t-test, p<0.001; (3) Simultaneous Recordings of the CPG pattern and the motor pattern, Figure 2—figure supplement 1B and Figure 5C: paired t-test, p<0.001. Finally, the intersegmental Δϕ of the CPG pattern also exceeded that of the motor pattern (paired t-test, p<0.001) in the nine simultaneous Bilateral Recordings of the CPG pattern and the motor pattern (Figure 2—figure supplement 1C; both coordinations, both sides; data not shown). Next, we determined the angular variances of these intersegmental phase differences for the animals in which we made bilateral recordings (Figure 2—figure supplement 1C), calculated the population variance for each level, and determined the confidence interval for each level with bootstrapping (10,000 times with replacement) (significance level: 0.05; Figure 4C). The population variances of these intersegmental Δϕ were substantial (among the largest variances determined in this study) indicating considerable variability in the population. The smaller population of bilateral recordings reported here (Figure 2—figure supplement 1C) nevertheless represents the larger populations (Figure 2—figure supplement 1A,B) reasonably well, because their confidence intervals overlap extensively (compare Figure 4 and Figure 5). We had previously shown that at none of the network levels was intersegmental Δϕ correlated with the cycle period (Norris et al., 2006; Wenning et al., 2004a; Wenning et al., 2004b). 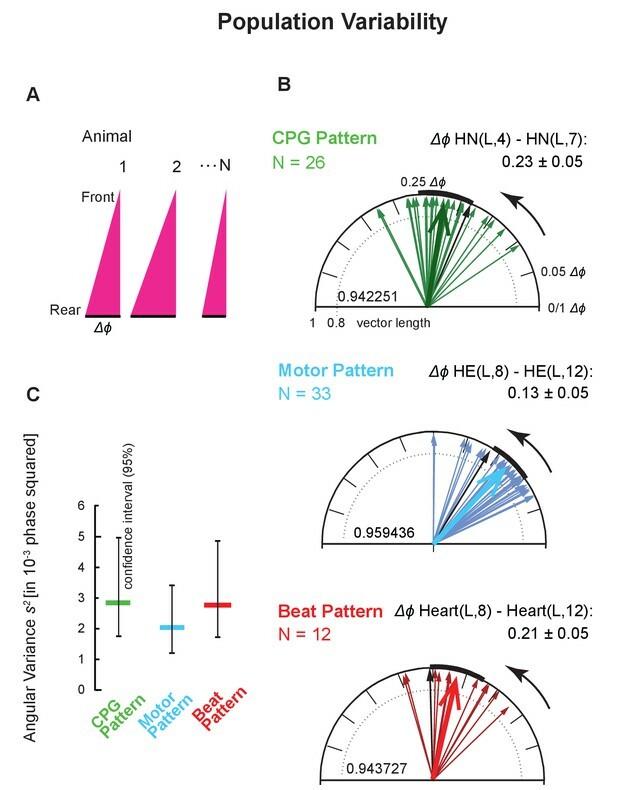 We corroborated these results for the CPG pattern and the motor pattern using our Project Database (Figure 2—figure supplement 1A) and found no correlation over a cycle period range of 4 to 13 s for the 129 HN interneurons and of 5 to 11 s for the 83 heart motor neurons (data not shown). The variance of the motor pattern in the bilateral recordings of Figure 4C appears to be lower than that of the CPG or motor plant although the confidence intervals overlap. To clarify whether the motor pattern does indeed have a lower variance than the CPG pattern, we used our larger databases. We calculated the angular variances using the entire Project Database (Figure 2—figure supplement 1A) and found that variances were higher in the CPG pattern than in the motor pattern (0.0038, CPG pattern; 0.0020, motor pattern) with no overlap in the bootstrapped 95% confidence intervals (Figure 5B). To eliminate the possibility that this difference results from CPG and motor pattern recordings being made in different preparations, we calculated the angular variances from simultaneous (mostly unilateral) recordings of the CPG pattern and the motor pattern (Figure 2—figure supplement 1B). We found that variances were also higher in the CPG pattern than in the motor pattern (0.0043, CPG pattern, 0.0018 motor pattern), again with no overlap in the bootstrapped 95% confidence intervals (Figure 5D). Two aspects of the CPG output determine the motor pattern for the HE motor neurons of segments 8 to 14: the Δϕ of the premotor interneurons of the CPG and their synaptic strength (Wright and Calabrese, 2011a, 2011b). For this study, we quantified Δϕ and synaptic strength for two of the four pairs of the premotor interneurons on both sides simultaneously (Figure 2A1). These factors combine with the intrinsic properties of the HE motor neurons and their electrical coupling between bilateral homologs to determine when an individual HE motor neuron fires in a heartbeat cycle (Shafer and Calabrese, 1981; Wright and Calabrese, 2011b). While the phase difference of the premotor HN interneurons is the same in all the segments considered here, the synaptic strength of their connections to motor neurons progressively changes across segments although there is considerable individual variability (Norris et al., 2006, 2007a; Norris et al., 2011; Wright and Calabrese, 2011a, 2011b). In peristaltic coordination, the phase progression of the premotor bursting pattern determines the maximal phase range, and segment-specific synaptic strength pattern, intrinsic properties and coupling determines the phase realized between two ipsilateral motor neurons (Wright and Calabrese, 2011b). The Δϕ that the motor neurons achieve is a portion of the Δϕ of the premotor interneurons of the CPG depending on the number of segments considered (Figure 4 and Figure 5). Therefore, because the Δϕ of the motor pattern (HE(8) to HE(12)) is significantly smaller than that of the CPG pattern (Figure 4—source data 1), it expresses less of the CPG’s variability. Under this hypothesis, as more or less of the CPG’s Δϕ is expressed then more or less of its variability is expressed. We found that this was the case. In some of our bilateral HE recordings we recorded the HE(14) (N = 15) or the HE(10) (N = 9) along with the HE(8). 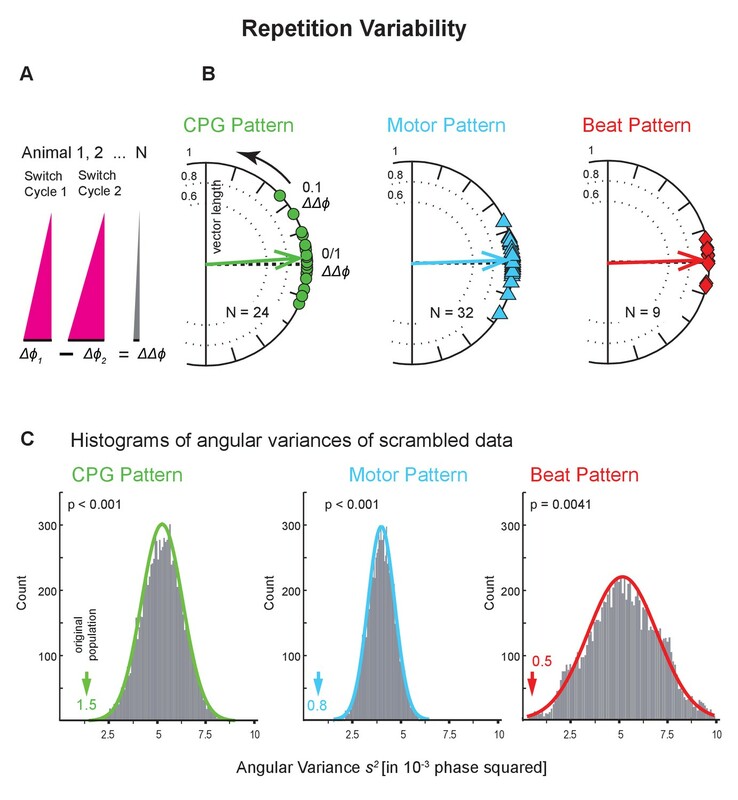 Indeed, variances increased as the motor pattern’s Δϕ approached that of the CPG as more segments intervened between recorded motor neurons (Figure 4—figure supplement 1). While ongoing, leech heartbeat is episodic; the CPG, motor neurons, the hearts alternate between two coordination states at regular intervals (Figure 2; Calabrese, 2010). How similar is the same coordination when repeated on the same side a few minutes later by the exact same neurons? We assessed this repetition variability at all levels using the Bilateral Recordings and the Intact Animal Database where we had imaged the beat pattern on both sides (Figure 2—figure supplement 1C,D). We subtracted the average intersegmental Δϕ of one switch cycle from that of another, subsequent switch cycle (ΔΔϕ = Δϕ1 - Δϕ2; Figure 6A) and calculated the variance of that distribution. This difference between the two intersegmental phase differences (ΔΔϕ) is 0 when the two switch cycles have identical intersegmental phase differences (Δϕs). The circular phase plots of Figure 6B show the ΔΔϕ between two consecutive switch cycles across animals for all levels, and show that, indeed, the average phase difference is near 0. Repetition variability across levels and animals. (A) The average intersegmental Δϕ of two subsequent switch cycles were subtracted from each other (Δϕ1 - Δϕ2). This difference of phase differences (ΔΔϕ) becomes 0 if Δϕ1 and Δϕ2 are identical. (B) Circular phase plots show ΔΔϕ for all preparations for all levels colors as in Figure 4. Each symbol on the circular phase plots represents the ΔΔϕ of one preparation. Thick arrows show the average ΔΔϕ and their length the angular variance. Note that vector phases are close to 0. (C) Histograms of the angular variances of 10,000 populations where the average intersegmental Δϕ of switch cycle two from one animal had been randomly subtracted from the average intersegmental Δϕ of switch cycle one from another animal (scrambling). Colored arrows point to the variance of the original population (value next to each arrow). The p values for each histogram were calculated from the z score of the normal distribution (colored lines) of the scrambled populations. Note that on each level scrambling resulted in significantly higher variances than that of the original population. Data within side (left) and coordination (peristaltic). Animal Groups: Bilateral Recordings (Figure 2—figure supplement 1C) and Intact Animal Database (Figure 2—figure supplement 1D). We found that consecutive bouts of the same pattern differed in half of the preparations (CPG pattern: 10 of 24; motor pattern: 17 of 32; beat pattern: 5 of 9; unpaired t-tests; Figure 6—source data 1). To evaluate the difference between repetitions, we compared these ΔΔϕ to the average intersegmental phase difference Δϕ, and found the ΔΔϕ to be an order of magnitude smaller (ΔΔϕ vs Df : 0.028 vs 0.23, CPG pattern; 0.021 vs 0.13, motor pattern; 0.023 vs 0.21, beat pattern). To determine how the repetition variance compared with that across animals, we calculated the variance of scrambled pairs of switch cycles 1 and 2 using all preparations in the dataset and repeated this procedure 10,000 times. At all levels, the repetition variance in the original population was much smaller than in the scrambled populations (Figure 6C; p<0.005 for all levels). The differences between repetitions that we did find can be attributed not to their large size but to the overall low cycle-to-cycle variances (Figure 3). Repetition variances were equally low on the two sides and in both coordinations. The one exception which had a high repetition variance (right heart, synchronous) is most likely due to an outlier in this small sample. On all levels, across coordinations and sides, repetition variances were significantly lower than those in the population (Figure 6 and Figure 6—source data 1). Our results show that the repetition variances were small and suggest that they do not contribute substantially to the population variance. The leech heartbeat system is composed of bilaterally homologous elements (interneurons, motor neurons, and hearts; Figure 1 and Figure 2) which allowed us to assess how similar the same coordination is when executed by the genetically identical contralateral homologs of the same neurons and muscles. We assessed this bilateral variability at all levels using the Bilateral Recordings and the animals where we had imaged the beat pattern on both sides (Figure 2—figure supplement 1C,D). We subtracted the average intersegmental Δϕ of one side from that of the other side (within coordination and level) (ΔΔϕ = ΔϕR - ΔϕL; Figure 7A) and calculated the variance of that distribution. This difference between the two intersegmental phase differences (ΔΔϕ) is 0 when the two sides have identical intersegmental phase differences(Δϕs). The circular phase plots of Figure 7B show the ΔΔϕ between the two sides across animals for each level. Bilateral variability across levels and animals. (A) The average intersegmental Δϕ between two segments on the right and on the left body side were subtracted from each other (ΔϕL - ΔϕR) (peristaltic). This difference of phase differences (ΔΔϕ) becomes 0 if phase differences are identical on the two sides. (B) Circular phase plots show ΔΔϕ for all preparations for all levels (colors as in Figure 6). Each symbol on the circular phase plots represents the ΔΔϕ of one preparation. Thick arrows show the average ΔΔϕ and their length the angular variance. Note that vector phases are close to 0. (C) Histograms of the angular variances of 10,000 populations where the intersegmental Δϕ on the right side of one animals had been randomly subtracted from the left side from another animal (scrambling). Colored arrows represent the variance of the original population (value next to each arrow). Note that the variances of the CPG pattern and the beat pattern of the original population do not differ from the scrambled populations, while in the motor pattern the variance from the original population is significantly lower than the variances of the scrambled population. The p values for each histogram were calculated from the z score of the normal distribution (colored line) of the scrambled populations. Layout as in Figure 6. Animal Groups: Bilateral Recordings (Figure 2—figure supplement 1C) and Intact Animal Database (Figure 2—figure supplement 1D). The mean ΔΔϕ at each level was near zero and evenly distributed, eliminating the possibility of a dominant form of handedness in the heartbeat system. Bilateral variances at each level were substantial (Figure 7C). We found that the mean of the absolute values of the ΔΔϕs (|ΔΔϕ|) between sides were about 2–3 times larger than the |ΔΔϕ|s between repetitions (CPG pattern: 0.06 vs 0.03; motor pattern: 0.04 vs 0.02; beat pattern: 0.06 vs 0.02; compare Figure 6—source data 1 and Figure 7—source data 1). Hence bilateral variances at each level were 3-4fold higher than the repetition variances (in 10−3 phase squared: CPG pattern, 5.1 vs 1.5; motor pattern, 2.1 vs 0.8; beat pattern, 4.5 vs 0.5; compare Figure 6—source data 1 and Figure 7—source data 1). Moreover, we found that the bouts of the same coordination on the two sides differed in most cases (CPG pattern: 20 of 26; motor pattern: 29 of 33; beat pattern: 8 of 11; unpaired t-tests; Figure 7—source data 1), yet, the average phase difference is similar on the two sides (Figure 7—figure supplement 1). To determine how the bilateral variance compared with the population variance, we calculated the variances of scrambled pairs (one from the left, one from the right side) using all preparations in the dataset and repeated this procedure 10,000 times. In the CPG pattern and in the beat pattern, the bilateral variance in our data set was not significantly different from the scrambled populations (Figure 7C; p=0.18 and p=0.15, respectively). In the motor pattern, however, the bilateral variance was significantly smaller than in the scrambled populations (p<0.001). We obtained the same result when using the HE(8) to HE(14) motor pattern where population variance was higher (Figure 4—figure supplement 1; plot not shown). In synchronous coordination, on all levels of the network, bilateral variances were lower in the original population than those of the scrambled data (Figure 7C). These results suggest that at least for the CPG and the motor plant when in peristaltic coordination, differences between homologous elements, as reflected in the bilateral variances, may contribute significantly to the population variance. Across levels, intersegmental phase differences on one side do not correlate with those on the other side (data not shown). The CPG network distributes its output over an ensemble of motor neurons in a stereotyped pattern of synaptic connections (Calabrese, 1977; Thompson and Stent, 1976a). The HN(4) and HN(7) interneurons we recorded for this study make connections to all motor neuron pairs of segments 8 to 18 (Calabrese, 1977; Shafer and Calabrese, 1981; Thompson and Stent, 1976b) (Figure 1). The synaptic strengths of the individual premotor HN interneurons have distinct average segmental profiles but vary across animals (Norris et al., 2007a, 2007b, 2011). For example, on average, synaptic strength of the HN(4) interneuron is highest in the HE(8) motor neuron and weakens towards more posterior heart motor neurons while the synaptic strength of the HN(7) interneuron is highest between the HE(10) and HE(14) motor neurons. Synaptic strengths do not change with changes in coordination states (Norris et al., 2007a). Figure 8 shows the connection strength of the premotor heart interneurons to several ipsilateral motor neurons on both sides using a subgroup of the bilateral recordings from the HN interneurons (‘Synaptics’, Figure 2—figure supplement 1C). Comparing the two sides let us assess variabilities emerging during development in bilaterally homologous neurons. Specifically, we voltage-clamped three pairs of heart motor neurons (HE(R/L,8), HE(R/L,10), and HE(R/L,12)), one after the other, while simultaneously recording extracellularly from two pairs of premotor interneurons (HN(R/L,4) and HN(R/L,7)). Using spike-triggered averaging (described in Norris et al., 2007a), we determined the synaptic strength from the HN interneurons to their ipsilateral motor neurons in at least 10 bursts per interneuron/motor neuron pair. Figure 8A shows the synaptic strength from the HN(4) and HN(7) interneurons to each of the three ipsilateral heart motor neurons. As detailed above, synaptic strength of the HN(4) interneuron tends to be higher in the HE(8) than in the HE(12) motor neuron while synaptic strength of the HN(7) interneuron tends to be higher in the HE(12) than in the HE(8) motor neuron, and synaptic strengths tend to be about equal in the HE(10). Synaptic strengths on the two sides vary and are not identical – but how similar are they? Variability of synaptic strength across animals. (A) Each data pair represents the right and the left synaptic strength (in nS) from premotor interneurons HN(4) (green) and HN(7) (blue) to the ipsilateral heart motor neurons HE(8) (A1), HE(10) (A2), and HE(12) (A3) in the same animal. Synaptic strength does not differ between sides (paired t-test; p values on plot). (B) Proportion of the total HN(4) + HN(7) synaptic strength due to the HN(4) interneuron on each side for each motor neuron. Note that the two sides do not differ in average proportional strength (p values: original data, and, in parenthesis, the mean p value after scrambling between left and right). Animal Group: Bilateral Recordings, ‘Synaptics’ (Figure 2—figure supplement 1C, dashed green circle). To compensate for differences in the quality of voltage-clamp recording of individual neurons we computed the proportion of the synaptic strength due to the HN(4) premotor interneuron on each side for each motor neuron (Figure 8B). Right and left body side did not differ (paired t-test; p=0.23 HE(8), p=0.91 HE(10), p=0.99 HE(12)), indicating no systematic bilateral bias. The mean p values after randomly combining the two sides 10 000 times were HE(8): 0.25, HE(10): 0.89, and HE(12): 0.98 (Figure 8B). The results show that despite a lot of variation in individual strength (nS; Figure 8A), the two sides do not differ in proportional synaptic strength (Figure 8B) indicating that bilateral variability does not seem to contribute to the population variability in synaptic strength. In the motoneuronal network of Drosophila larvae motor neurons of the same cell type contacting a common interneuron can have quite different numbers of synapses but whether the number of synapses correlate with synaptic strength is unknown (Couton et al., 2015). Across a population, the neuronal networks of individual animals arrive at unique sets of underlying parameters such as ionic conductances and synaptic strengths to achieve functional stereotypical output. This underlying variability has been well recognized and studied (Ciarleglio et al., 2015; Goaillard et al., 2009). What is less realized is that stereotypical functional output is itself variable across individuals. Our work on the leech heartbeat CPG, motor pattern and heartbeat has contributed to this realization and led to the conclusion that individual animals produce unique functional patterns at all levels – CPG, motor neurons, muscle - (Norris et al., 2011; Wenning et al., 2014; Wright and Calabrese, 2011b). Here we sought to determine the range of functional output to explore the potential sources of variability across individuals, and, for the first time, to compare variabilities across levels: CPG, motor neurons, hearts. We did this for both motor programs produced in leech heartbeat. We focused on phase, which is a critical output characteristic of any coordinated motor program and its underlying neuronal circuitry. Cycle-to-cycle variability within individuals reflects imprecision in the underlying neuronal networks and muscles. This variability is thought to arise principally from the stochastic nature of all biochemical processes, particularly ion channels, synaptic release, and neuromuscular systems (Marder and Calabrese, 1996; O'Leary et al., 2014; Roffman et al., 2012). In leech heartbeat, the cycle-to-cycle variabilities of intersegmental phase differences (Δϕs) were small (Figure 3 and Figure 3—source data 1). 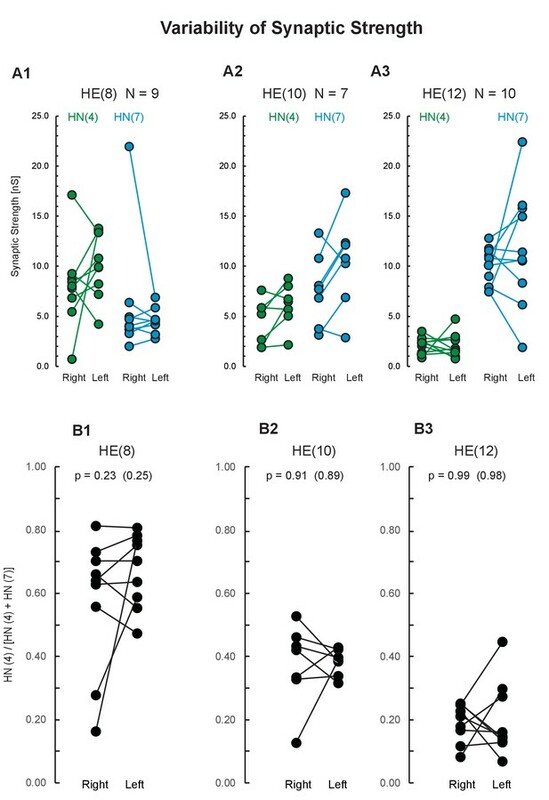 Across levels and in both coordinations they were only slightly higher than that for the bilateral pair of HN(4) interneurons, which are part of the strongly, monosynaptically, and reciprocally interconnected timing network (Figure 1, Figure 3A). Variances are reported from the gastric pattern in the isolated crab STNS within animals but this is convolved across episodes over many days (Hamood and Marder, 2015). In this episodic motor pattern, cycle-to-cycle variabilities were substantially larger than those in the ongoing leech heartbeat CPG pattern and motor pattern. Cycle-to-cycle variance of Δϕ in the swim episodes of larval zebrafish seems also rather large judging from the representative example shown (Wiggin et al., 2014). Many motor programs are shaped, and often stabilized, on a cycle-to-cycle basis by sensory feedback. Prominent examples are locomotion e.g., insects (Büschges, 2005), mastication in decapod crustaceans (Marder et al., 2014), and feeding in Aplysia (Cullins et al., 2015a, Cullins et al., 2015b). Recording from two reporter motor neurons in the Aplysia feeding circuit, Cullins et al., 2015a found that sensory feedback increases the variability within animals, i.e., decreasing stereotypy, but decreases variability across animals so that a common solution space for functional output emerges (Cullins et al., 2015a). Intriguingly, the variability of individual motor components is negatively correlated with their importance in behavioral performance (Lu et al., 2015). In leech heartbeat, the premotor HN interneurons on one side dictate a common relative timing (phase) of the premotor inputs to all ipsilateral heart motor neurons (Figure 1; Maranto and Calabrese, 1984a, 1984b; Norris et al., 2007a, 2007b). Any local sensory input to the CPG representing a segmental perturbation, if present, would thus affect all motor neurons. Our recordings of the CPG and motor neurons are in the absence of any potential feedback. The period of leech heartbeat is modulated by a variety of inputs. Period decreases with higher metabolic demand (e.g., locomotion) and higher temperatures, and increases in higher ambient oxygen (Arbas and Calabrese, 1984, 1990; Davis, 1986). At the same time, as in other rhythmic behaviors (e.g., lobster and crab STNS, Bucher et al. (2005); Hamood et al., 2015; crawling in larval Drosophila, Pulver et al. (2015); zebrafish swimming, Masino and Fetcho, 2005) intersegmental phase differences do not correlate with cycle period. We emphasize that this ‘phase constancy’ as embodied in a lack of correlation between phase and period across animals should not be construed as suggesting that phase does not vary within individuals or indeed the lack of correlation of period and phase. In crabs, the phase relations across many gastric episodes across many days in the isolated STNS are significantly correlated with gastric frequency as seen from two individual examples (Hamood and Marder, 2015). In larval zebrafish, swimming occurs in episodes with declining cycle period (Masino and Fetcho, 2005) making this preparation ideal to determine whether intersegmental phase delay scales with the cycle period in an individual episode. The population variability in the leech, at all levels, was about 2–3 times higher than the cycle-to-cycle variability (Figure 3 and Figure 4). Similarly, in the pyloric pattern of the isolated STNS, variances were much lower within than across animals (Hamood et al., 2015). In the episodic gastric pattern, however, variances within animals, but again convolved across episodes across many days, were comparable to those across animals (Hamood et al., 2015). Variability increases when modulatory input is compromised (decentralization), in both the pyloric and the gastric pattern in the crab STNS (Hamood and Marder, 2015). In contrast, variability in interlimb phase decreases sharply in galloping mice after ablating all V0 commissural interneurons resulting in a bounding gait (Bellardita and Kiehn, 2015). Two potential sources for the large variability in phase across animals at each level of the leech heartbeat system are variability in the episodic repeats of the same motor program within an individual, and variability between bilaterally homologous elements, also within an individual. Episodic variability is seen as the two alternating patterns are repeated periodically by the same neurons and muscles (Figure 2). Repetition variances were significantly lower than expected from the population variance across both coordinations and levels, and therefore seem not to contribute to the population variability (Figure 6 and Figure 6—source data 1). Because in much of the literature episodes within an animal and across animals are convolved it is not easy to determine whether repetition variability (i.e., inter-episode variability) contributes to population variability. We suspect it does. For example, interlimb phase variance in galloping mice was assessed convolving 51 episodes across three animals so the large variance shown probably reflects large repetition variance (Bellardita and Kiehn, 2015). Similarly, in an elegant study on the motor and constriction patterns in fly larvae, covering forward and backward crawling, episodes and animals are convolved in the analysis presented, and the considerable inter-episode variability was not quantified (Pulver et al., 2015) though it certainly exists (personal communication, Stefan Pulver). In zebrafish literature again episodes and animals are convolved making it difficult to parse repetition variance and population variance (Masino and Fetcho, 2005; Wiggin et al., 2014). The heroic enterprise to record from several motor neurons in the STNS in vivo over several days (Yarger and Stein, 2015) does not tease apart the phase variability across episodes and across animals for the episodic gastric motor pattern. Variability between homologous cells within an individual can also contribute to variability seen in a population. For example, in the crab heartbeat system, the five (presumably) homologous motor neurons – which are part of the CPG in this system – can express different levels of a common set of membrane conductances to achieve synchrony (Lane et al., 2016; Ransdell et al., 2013). This system seems more tightly regulated in phase than the leech heartbeat neuronal network, reflecting the synchronized rather than segment-specific nature of its motor output. We took advantage of the bilateral layout in the leech heartbeat system to test whether variability in homologous elements can contribute to population variability. In the leech, neurons arise from bilaterally paired columns of blast cells derived from bilateral pairs of stem cells (teloblasts) each of which arises from a symmetric division. Such symmetry in the origin of bilateral blast cells gives rises to the concept of bilaterally homologous structures and cells. Blast cells differentiate into neurons, epithelia and muscles in each segment (Stent and Weisblat, 1985; Weisblat and Shankland, 1985). Yet, there is evidence for stochastic events during leech development, for example the bilateral OP neuroblasts undergo symmetric divisions but for each the fate of the daughter cells is determined by position, and also in the formation of unpaired neurons, where either the left or the right neuron dies (Blair et al., 1990; Stent and Weisblat, 1985; Weisblat and Shankland, 1985). At all levels, bilaterally homologous elements (neurons and muscles) participate in heartbeat with a single CPG orchestrating two different coordinations of motor neurons and heart muscles. Bilateral variances differed depending on level (CPG, motor neurons, motor plant) and coordination (peristaltic, synchronous). In synchronous coordination, on all levels, the variance of differences in intersegmental Δϕ between sides (ΔΔϕ) was significantly less than expected from the population (Figure 7—source data 1), and therefore unlikely to contribute to the population variability. 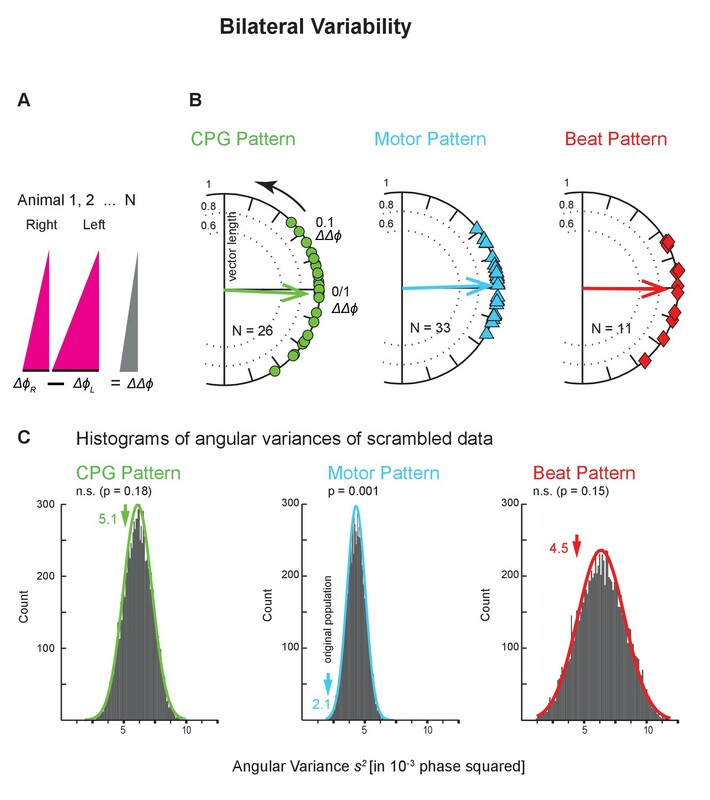 In peristaltic coordination, however, the variance between sides (ΔΔϕ) in the CPG pattern and in the beat pattern did not differ from the population but differed significantly from the population in the motor pattern (Figure 7 and Figure 7—source data 1). Therefore, such variability between homologous elements may contribute to the population variability at least for the CPG and the beat patterns when peristaltic. This bilateral variability might arise from stochastic processes during development as envisioned e.g., in the models of O’Leary and Marder (O'Leary et al., 2013; O'Leary et al., 2014). Nevertheless, an important source of population variability is likely genetic and life history differences inherent in our population. The sources of this high bilateral variability in the CPG and the hearts are likely to be different. For example, the bilateral homologs of the premotor interneurons of the CPG vary in the synaptic strengths of their connectivity pattern (Roffman et al., 2012) and likely in their intrinsic conductances. Each heart segment receives excitatory input from its ipsilateral motor neuron, these synapses may also vary in strength, and heart muscles may vary in their intrinsic conductances. Moreover, the exact timing of that heart segment’s constriction appears to depend on load (Wenning et al., 2014), which is unlikely to be identical on both sides in a soft-bodied animal like the leech (Wenning and Meyer, 2007). Despite the feedforward nature of the leech heartbeat system – CPG, motor neurons, heart muscle – we found that the high phase variance in the CPG in peristaltic coordination did not translate into an equally high variance in the motor pattern (Figure 4 and Figure 5). This puzzling result begs the question how the variance of the motor pattern is reduced. The peristaltic phase difference that the HE(8) to HE(12) motor neurons achieve is significantly smaller than that of the premotor interneurons of the CPG (Figure 4 and Figure 5). The phase progression of the premotor bursting pattern determines the maximal phase range, but the segment-specific synaptic strength pattern, intrinsic properties, and coupling determines the phase realized between two motor neurons (Wright and Calabrese, 2011b). The premotor phase differences and the synaptic strength patterns interact so that the phase difference of the motor neurons progresses smoothly across the segments (Wright and Calabrese, 2011b), and this smoothing and segment-to-segment attenuation of the CPG phase difference may limit the variance of intersegmental Δϕs, especially for nearby segments. In support of this conclusion, we observed that when a larger or smaller number of segments intervene between motor neurons are assessed, then the variance in the motor pattern reflects more or less the corresponding variance of the CPG (Figure 4—figure supplement 1). Thus, in segmentally distributed motor patterns (such as the swim networks of lampreys, fish, leeches, crayfish swimmerets and locomotor patterns in insects) it is important to define or, better even, to compare different sets of segments over which variability is assessed (Büschges, 2005; Grillner and El Manira, 2015; Ingebretson and Masino, 2013; Kristan et al., 2005; Mullins et al., 2011; Pulver et al., 2015; Smarandache-Wellmann et al., 2014; Wiggin et al., 2012). We interrogated a feed-forward motor control system to determine the output variability of phase among individuals at each level - CPG, motor neurons, muscles - and found that it varied at each level, which nevertheless did not obscure recognition of distinct coordinations. We attempted to identify some of the sources of this variability in output activity. It is unlikely due to variability in performing the same function multiple times since the repetition variances are low everywhere in the system. Some of this population variability may be due to differences between homologous cells in an individual. We observed that when the same motor act is performed by bilaterally homologous CPG neurons and heart muscles, variability in peristaltic phase on the two sides is as large as in the population itself. 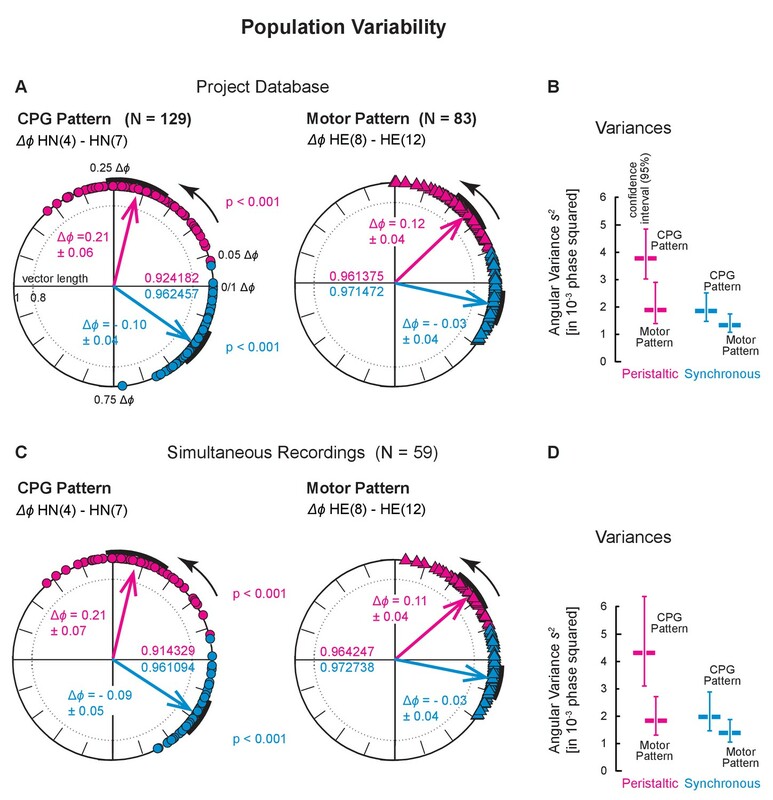 In other cases (peristaltic motor pattern and synchronous patterns at all levels), it appears likely that output variability is mainly associated with genetic and life history difference among individuals in the population. Across levels, phase variability was coordination-specific: similar at all levels in the synchronous but significantly lower for the motor pattern than for the CPG pattern in peristaltic coordination. Mechanisms involved in the transform from CPG to the motor neurons may limit the range of output variability in the motor pattern. We provide a roadmap for others that may wish to analyze variability in motor system and argue that existing data sets on the locomotor and other motor patterns of invertebrates and vertebrates can be teased apart to determine the sources of output variability. Adult leeches (Hirudo sp.) were obtained from commercial suppliers (Leeches USA, Westbury, NY, or Niagara Medical Leeches (www.leeches.biz/contact) and kept in artificial pond water at 16°C. Prior to all procedures, leeches were cold-anesthetized in crushed ice for about 10 min. Dissections were done in ice-cold leech saline (composition in mM: 115 NaCl, 4 KCl, 1.8 CaCl2, 10 glucose, and 10 HEPES buffer, adjusted to pH 7.4 with NaOH). Animals were superfused with leech saline during the electrophysiological experiments. For video-imaging, intact, adult leeches were flattened and covered with artificial pond water (details in Wenning et al., 2014). Experiments were done at room temperature (21–22°C). In what follows ganglion and segment numbers refer to midbody segments. Body side is indicated by R and L, i.e., HE(R,8) is the heart motor neuron in segment eight on the right side, and heart (L,8) is the heart in segment eight on the left side. Referring to both sides is indicated by L/R,i.e., HN(L/R,3) refers to the bilateral pair of heart interneurons in segment 3. We define a switch cycle as the time (or the number of neuronal bursts and heart constrictions, respectively) a given side needs to complete both coordination states, from peristaltic to synchronous to peristaltic or vice versa, one after the other. Thus, five switches are needed to record two consecutive complete switch cycles. The Project Database contains recordings of 153 preparations: HN interneurons in 129 animals and HE motor neurons in 83 animals (Figure 2—figure supplement 1A). The Project Database contains a common set (N = 59), in which both HN interneurons and HE motor neurons were recorded simultaneously (Figure 2—figure supplement 1B; 4-point recordings). In a subset of the HN recordings, bilateral HN interneurons were recorded (N = 17; 4-point recordings), and in a subset of the HE recordings bilateral HE motor neurons were recorded (N = 24; 4-point-recordings) (Figure 2—figure supplement 1A). In the common set of 59 HN/HE recordings, a subset of 9 were bilateral simultaneous recordings (Figure 2—figure supplement 1B,C; 8-point recordings). In this study, we report new bilateral recording of HN interneurons from a total of 26 animals and of HE motor neurons of 33 animals (Figure 2—figure supplement 1C). These include data on bilateral simultaneous recordings from the HE(8) and HE(14) motor neurons (N = 15) and from the HE(8) and HE(10) motor neurons (N = 9), which were recorded simultaneously with the HN(12) neurons (6-point recordings). We present new data on bilateral measurements of synaptic currents from a subset of the 26 animals in which bilateral HN recordings were made (N = 16; ‘Synaptics’, Figure 2—figure supplement 1C; 5-point recordings). We present the bilateral beat pattern for the first time from previously imaged intact adult leeches (Wenning et al., 2014); N = 12; Figure 1—figure supplement 1 and Figure 1—video 1; ‘Intact Animal Database’, Figure 2—figure supplement 1D). Electrodes were pulled on a Flaming/Brown micropipette puller (P-97, Sutter Instruments; http://www.sutter.com) from borosilicate glass (1 mm OD, 0.75 mm ID; A-M Systems; http://www.a-msystems.com). For extracellular recordings, suction electrodes were filled with leech saline and placed in a suction electrode holder (E series, Warner Instruments; http://www.warneronline.com). To ensure a tight fit between cell and electrode, electrode tips were drawn to approximately the diameter of the cell body of the HE motor neuron (30 µm) or the HN interneuron (15 to 20 µm), respectively. The electrode tip was brought in contact with the cell body and light suction was applied until the cell body was inside the electrode. Extracellular signals were monitored with a differential AC amplifier (model 1700, A-M Systems) at a gain of 1000 with the low- and high-frequency cutoffs set at 100 and 1,000 Hz, respectively. Noise was reduced with a 60 Hz notch filter. A second amplifier (model 410, Brownlee Precision; http://www.brownleeprecision.com) amplified the signal appropriately for digitization. Intracellular recording techniques and voltage clamp protocols were conventional and are described in detail in (Norris et al., 2007a, 2011). At the end of each voltage-clamp experiment, the electrode was withdrawn from the motor neuron. The experiment was accepted if the electrode potential was within ±5 mV of ground. Thus, holding potentials were accurate within ±5 mV. Data were digitized (>5 kHz sampling rate), using a digitizing board (Digi-Data 1200 or 1550 Series Interface (http://www.moleculardevices.com), and acquired using pCLAMP software (http://www.moleculardevices.com) on a personal computer. Electrophysiological recordings were done in isolated chains of ganglia. Those ganglia in which we recorded HN interneurons or HE motor neurons extracellularly were desheathed. We recorded from the HN(L/R,4) and HN(L/R,7) interneurons in 26 animals. In two animals, only one switch cycle was recorded so we assessed the repetition variability in 24 recordings. In 9 of the 26 animals we recorded simultaneously the HE(L/R,8) and HE(L/R,12) motor neurons (Figure 2—figure supplement 1C). We recorded from the HE(L/R,8) and HE(L/R,12) motor neurons in 33 animals. In one animal, only one switch cycle was recorded so we assessed the repetition variability in 32 recordings. In 9 of the 33 animals we recorded simultaneously the HN(L/R,4) and HN(L/R,7) interneurons (see above) (Figure 2—figure supplement 1C). In 20 animals, we attempted to voltage-clamp 6 motor neurons, one after another: the HE(L/R,8), HE(L/R,10), and HE(L/R,12) motor neurons to determine the synaptic strength from the HN(L/R,4) and HN(L/R,7) heart interneurons recorded simultaneously. Using spike-triggered averaging (for a detailed description of the methods see Norris et al., 2006, 2007a), we determined the synaptic strength in the left and right HE motor neurons (HE(8): N = 9, HE(10): N = 8, and HE(12): N = 10) in a total of 16 animals, i.e. in some animals, we successfully voltage-clamped several pairs of HE motor neurons, one after the other (Figure 2—figure supplement 1C). Video-imaging of intact, adult leeches provided the optical signals to determine the bilateral beat patterns, in the motor plant (i.e., the two hearts) in midbody segments 7 to 14 (N = 12; Figure 1—Video 1) (Figure 2—figure supplement 1D). These data were compiled previously, and data acquisition and analysis were described in detail in (Wenning et al., 2011, 2014). As for the motor pattern, we used segments 8 and 12. Imaging was limited to 10 min, which did not yield two complete switch cycles in all 12 animals. We assessed the repetition variability in 9 (left side) and 8 animals (right side), respectively. One animal was identified as an outlier (outside the 1.5*interquartile range on a Whisker barrel plot) because of the irregular sequence of constrictions in segments 8 and 9 on both sides in synchronous coordination. To further examine the intersegmental phase differences and the variability across individuals, we used our current Project Database which includes unilateral recordings from the HN(4) and HN(7) interneurons and from the HE(8) and HE(12) motor neurons since bilateral recordings are not necessary for this analysis (Figure 2—figure supplement 1A; N = 129, CPG pattern; N = 83, motor pattern). Some of these data were published (Norris et al., 2007a, 2011; Wenning et al., 2014) and some were presented at the Society for Neuroscience meeting in 2016 (Norris et al., 2016). We used specific points in time to calculate the intersegmental phase difference Δϕ between bursts of the two pairs of HN interneurons, the two pairs of HE motor neurons, and the constrictions of the two pairs of heart segments. The detailed description of the methods and the custom-made MATLAB codes have been published (Cymbalyuk et al., 2002; Masino and Calabrese, 2002c; Norris et al., 2007b; Wenning et al., 2004a, 2004b), so we summarize briefly here. To characterize the bursting patterns of the HN interneurons and HE motor neurons, spikes were detected based on threshold and then grouped into bursts (interburst interval ≥1 s). Stray spikes were eliminated. The middle spike (based on count) served as the phase marker for an individual burst. We then calculated burst period (T) and phase (ϕ). The burst period was defined as the interval in seconds from middle spike to middle spike of consecutive bursts (e.g. Figure 2, A2 for the HN premotor interneurons). Phases were referenced to an absolute phase reference (ϕ = 0), the HN(4) interneuron on the right side. The phases of the HN(4) premotor interneuron on the left side, those of the two HN(7) premotor interneurons, and, if applicable, those of the four HE motor neurons were determined on a cycle-to-cycle basis. Phase differences (HN(R,4) - HN(R,7), HN(L 4) - HN(L,7), HE(R,8) – HE(R,12), and HE(L,8) - HE(L,12), respectively, were defined as the difference between the time of their middle spikes (ti) and the time of the middle spike of the reference segment (tr) in the same cycle divided by the reference cycle period (Tr) expressed as (ϕr-i = [(ti –tr)/Tr]). For the beat pattern of the hearts, the phase reference was the maximum rate of rise (MRR) of the digitized optical signals of an individual heartbeat cycle (Figure 1—figure supplement 1B, inset). The MRR corresponds to emptying (systole) and maximal heart constriction (Wenning et al., 2014). We determined the intersegmental Δϕ between heart segments 8 and 12 on the left and on the right side, using the ipsilateral heart segment 8 as the phase reference. Inhibitory postsynaptic currents (IPSCs) from the ipsilateral HN(4) and HN(7) heart interneurons were recorded in three pairs of heart motor neurons (HE(R/L,8), HE(R/L,10), and HE(R/L,12)). To normalize across different holding potentials, IPSCs were converted to, and reported as, conductances (reversal potential: −62 mV; Angstadt and Calabrese, 1991). Angular variances were calculated by using the Cartesian average of polar phase vectors. Circular (or polar) plots were drawn, and the statistics were calculated using the Pandora Toolbox (Günay et al., 2009). The code, custom scripts, and the data can be found in: Sources of variability in a motor system, Calabrese, 2018). Using vector summation, we found the mean vector phase and length r (as a measure of concentration) with 1-r as a measure of dispersion. From the vector length, we calculated the angular variance s2 = 2(1-r) (in radians squared) and from this the angular standard deviation s (in radians) (Zar, 1974). We report these values in phase units squared or phase units by dividing by 4π2 and 2π, respectively. To assess the cycle-to-cycle variability, we used the intersegmental phase differences between two segments (Δϕ) burst-by-burst and beat-by-beat, respectively, within body side and coordination. Data on consecutive switch cycles were kept separate. This analysis yielded 4 data sets per body side for each level (peristaltic 1, synchronous 1, peristaltic 2, synchronous 2); 24 sets total. To assess the population variability, we used the average intersegmental Δϕ of a single switch cycle on each level, for each side and coordination. To assess whether these population variances differed between levels we resampled the data (with replacement; 10,000 times; ‘bootstrapping’), calculated the 95% confidence intervals, and compared variances between two levels. This analysis yielded 4 data sets for each level, 12 sets total. We plotted the individual ΔΔϕ in a circular phase plot and calculated their variance. This analysis yielded 4 data sets for each level, 12 sets total. We repeated this procedure 10,000 times after randomly combining (scrambling) two switch cycles from different animals, and calculated the p values from the z score of the normal distribution of the scrambled populations. The motor pattern and the beat pattern were treated the same way. We plotted the individual ΔΔϕ in a circular phase plot, and calculated their variance. This analysis yielded two data sets (one for each coordination) per level, 6 sets total. We repeated this procedure 10,000 times after scrambling the data from the right and left body sides from different animals, and calculated the p values from the z score of the normal distribution of the scrambled populations. The motor pattern and the beat pattern were treated the same way. We assessed the variability of the synaptic input from premotor heart interneurons HN(R,4) and HN(R,7) to heart motor neurons HE(R,8), HE(R,10) and HE(R,12), and from heart interneurons HN(L,4) and HN(L,7) to heart motor neurons HE(L,8), HE(L,10) and HE(L,12). This analysis yielded two data sets per motor neuron pair, 6 sets total (Figure 8A). To evaluate the synaptic input further and to eliminate any differences due to the quality of the voltage-clamp recordings, we calculated the proportion of the synaptic strength due to the HN(4) premotor interneuron on each side using its ratio to the sum of the synaptic inputs of both premotor interneurons HN(4)/[HN(4) + HN(7)], separately for each side (Figure 8B). We used a paired t-test to assess whether the two sides were different. Next, we scrambled the data from the right and left body sides from different animals (10,000 times), and calculated their p values using a paired t-test. We used means ±SD for descriptive statistics. Journal of Comparative Physiology A 155:783–794. Journal of Comparative Physiology A 167:665–671. Current Opinion in Neurobiology 41:68–77. Journal of Comparative Physiology 122:111–143. The Journal of Experimental Biology 82:163–176. In: G. M Shepherd, S Grillner, editors. Handbook of Microcircuits. Oxford: Oxford University Press. pp. 450–456. The Journal of Experimental Biology 123:401–408. The Journal of Experimental Biology 186:157–171. Journal of Computational Neuroscience 10:281–302. Frontiers in Neural Circuits 7:109. Journal of Comparative Physiology A 154:367–380. Journal of Comparative Physiology A 154:381–391. San Diego, CA: Society for Neuroscience. Cell and Tissue Research 214:137–153. Annual Review of Neuroscience 8:45–70. Journal of Comparative Physiology ? A 111:261–279. Journal of Comparative Physiology 111:281–307. Philosophical Transactions of the Royal Society B: Biological Sciences 312:39–56. Journal of Experimental Biology 210:2627–2636. Journal of Experimental Biology 218:3950–3961. New Jersey: Simon and Schuster. Thank you for submitting your work entitled "Sources of variability in a motor system" for consideration by eLife. Your article has been reviewed by three peer reviewers, one of whom is a member of our Board of Reviewing Editors and the evaluation has been overseen by a Senior Editor. Our decision has been reached after consultation between the reviewers. Based on these discussions and the individual reviews below, we regret to inform you that your work will not be considered further for publication in eLife. Nonetheless, if you feel that a significant rewrite could address the bulk of the reasonable issues raised by the reviewers (including some of the parts of the consultation session included here), we would be willing to consider a new version along those lines. This manuscript and its reviews engendered a long and spirited discussion among the reviewers, the Reviewing Editor and the Senior Editor. The Reviewing Editor's initial summary was: "While all reviewers saw the value of this meta-analysis, they also missed the experimental approach that brings this beyond the descriptive level. The reviewers also didn't see a quick fix to add critical experiments to link the data in a meaningful manner. They also felt that the authors did not attempt to appeal to a general readership which would make this study more attractive for eLife." a) It was difficult to figure out which data came from the same animals, and therefore really supported the up and down level of organization point you were trying to make. b) The manuscript itself is very invertebrate-centric and there may be useful and informative vertebrate work that should be cited. c) The manuscript has to proactively argue, at least in a good paragraph in the Discussion section, why you believe that the variability is not due to experimentor-error. d) It is not clear that the stats are properly done or presented (SEs versus SDs, etc.). e) The argument about developmental stochasticity being responsible for left/right differences is very speculative and should be relegated to a Discussion point but not elevated to the extent it is in the present version. f) The Abstract was hard to parse. g) Is it really the case that the variability increases and decreases across the levels of organization? If so, is that an interesting result that needs a possible explanation? This finding is probably part of what motivated a reviewer to worry/wonder about experimental error. We understand that it may not be possible to do a manipulation that would address the Reviewing Editor’s initial evaluation, but points a-g are clearly fixable. "But there could be controlled measurements in their data set. I don't think they need measurements of all levels in the same animals – even if they led us on a transitive journey of dual measurements where A+B and B+C told us something about variability in A relative to C. Without these (which are definitely not in this version of the manuscript), every bias against the variability story will come into play and every can of worms will be opened as people read this study. " "First, the premise about developmental stochasticity is nothing more than a speculation and should be introduced as that in a much more restricted fashion. Second, many, if not all of the standard errors should be standard deviations. More critically, I am not sure exactly what was used as N's to calculate p values. there appear to be some very very small p's that may have resulted from using number of cycles not animals. So, I am not sure that all of the stats are correctly done." "I agree that the paper is highly invertebrate-centric, but I am not sure whether a similar data exists in a vertebrate? If so, they should certainly consider it." "Data such as these that clearly pose the issue of whether variability at one level is transmitted to another are rare anywhere, and if properly presented, I think this would be a valuable contribution…What I find intriguing is that at face value the variability does not change monotonically across levels, and they don't really address that adequately." "I guess I just think that this paper is a very brave attempt to do something that needs to be done, and with all of the issues of the present version, there is nothing quite like it in the literature and it is addressing a very interesting problem." "I am not as convinced that it is possible to parse what is experimentally induced variation versus biological variation in the various comparisons in the paper. I wish it had actually been addressed head on in the paper." "I guess my problem was/is that I have/had a preconceived idea what to expect from a paper dealing with variability, and I didn't see this in the manuscript -hence my negative reaction. In mammalian rhythm generating networks (e.g. neocortex and of course the respiratory network) you find a huge amount of cycle-to-cycle variability which is the reflection of the stochastic activation/synchronization of weakly coupled neurons. And also, we find of course a huge variability in the types of inward/outward currents in rhythm generating neurons. Thus, variability is a big deal in how these networks operate and studying this variability using computational approaches, gives you interesting insights into the network architecture. Variability is also reflected into how the network oscillation is transmitted to the motor output. Anyhow, we and other used experimental and computational approaches to dissect the mechanisms for this variability and how it assembles these rhythm generating networks. All this is built on the wonderful work that has been done in invertebrates. I didn't see anything of this in this paper. This paper appeared to me like a big collection of variability data that are found at different levels of integration – but I didn't see the big picture question." This study addresses an important issue in neurobiology: i.e. the nature of cycle-by-cycle variability in rhythm generating neuronal networks. The authors are surprisingly agnostic to the literature in mammalian rhythm generating networks, and focus primarily on the leech heart beat system with some reference to other invertebrate rhythm generating systems. This omission unnecessarily limits the scope of this fundamentally, important issue. The authors base their study on a larger data set, which allows them to compare sources of variability at various levels of integration from the cellular level to the behavioral level. However, one major weakness of this meta-analysis is the absence of experimental attempts to explore the actual mechanisms that underlie this stochastic variability, and the question how variability at one level influences another level. The dataset presented in this manuscript seems ideal for a subsequent computational approach, which could model the detailed data to explore how variability at one level influences variability at another level of integration. This would be one kind of "experimental approach" that could be very informative and would likely provide interesting mechanistic insights and testable hypotheses. But, without a computational approach or actual experiments in this ideal model system, the study remains very descriptive. The authors have compiled an extensive and impressive resource of data for motor pattern output across three levels of organization for a CPG network responsible for heart contraction in the leech. In a thorough and insightful analysis, they reveal that output variability across individuals, as measured by phase relationships, is different at different levels of the feedforward circuit, with the least variability seen at the level of the motor network, as opposed to the CPG or musculature. This is a compelling insight. 1) The nature and scope of the data themselves, and the nature and scope of the interpretation and discussion, are not in balance. Even from the title, "Sources of variability[…]" this imbalance is established, as I do not feel the authors are in any way assessing the mechanistic underpinnings or sources of variability. In particular, the use of bilateral measurements – and the demonstration therein of differences – is held up as evidence of "stochasticity in developmental pathways" among genetically identical cells and networks. One cannot argue with the genetics in question, but there is no evidence whatsoever to support this hypothesis. Indeed, inherent in this perspective is a bias that these are truly bilaterally symmetrical. Is there any data to support this assertion, or is this just an assumption? One could make the case that at a superficial level the mammalian heart is bilaterally symmetrical as well, but physiologically the pulmonary and systemic circuits are clearly differentiated in their function and underlying physiology. If this is the focus the authors wish to take, there needs to be a substantial redirection of the introduction and discussion of this work to try to make this case. Else the authors may have stumbled on to compelling physiological evidence to call into question the idea that the annelid heart is indeed a bilaterally symmetrical structure (at this point, an equally parsimonious – if not more so – interpretation of the data). In short, I do not feel that anywhere in the manuscript the authors make a compelling enough case to draw any conclusions about sources of variability. Phenomenologically, the variability is clear – but the etiology is completely unexplored in this study. 2) Variability is perhaps one of the more difficult phenomena to quantify, due to its – well, variability. Because the data in this study are substantially meta-analytical, there is substantive lack of experimental control over potential sources of variability that preclude combining these data into one analysis. For example, comparing the amount of variability in measurements of muscle output for data collected multiple years ago with a cohort of animals entirely distinct of that from which the motor neuron output was collected is potentially confounding. The authors utilize animals supplied from multiple vendors outside of their own control (are they wild caught or reared?). How can one ensure rearing conditions, environmental variables, etc. are consistent between vendors – or across time – to appropriately cross-compare these different data sets into one analysis? Is there any potential species confusion across the time span of these studies? Indeed, the species used is listed only as "Hirudo sp." and recently Hirudo has undergone a species reclassification. if the authors may be inadvertently, and more importantly asymmetrically, combining data from multiple species this is highly problematic. The most compelling data are those in which multiple levels of analysis are achieved from the same individuals – statistics for these are reported as a sub-population in the text, but to me the most informative analysis would be a correlation of variability in, for example, motor neuron variability and muscle output variability across individuals in which data were obtained for both. The authors do apparently have 9 instances of paired CPG and motor neuron recordings, as well as simultaneous motor and beat pattern from an earlier study (Wenning et al., 2014). By lumping these data together as populations, and not controlling the abovementioned sources of variability among individuals, the authors lose power for their interpretation. 3) There is an unexplored aspect to these data that I would have appreciated hearing the authors' perspective on. That is, what are the functional implications – costs, tradeoffs, etc. – for differing variability across these levels? In other words, why should the system require highest constancy of phase at the level of motor neurons? And just as interesting, how is this achieved – how does a system take feedforward input from a CPG and decrease the variability in that input signal? I am keenly interested to hear the authors' insight on this mechanistic question, and its functional consequences – and I feel this is the more compelling aspect of the data presented. In sum, I really enjoyed the thorough analysis of these data and the collection and curation therein that allows for interesting comparisons across levels of organization in a feedforward system. I am less convinced that pitching this work in the context of "sources of variability" is congruent with the data at hand. The challenges associated with a meta-analysis in this context are significant. This paper explores an important question concerning how variable a motor output is within and across animals at the level of the CPG, the motor output, and the behavior. There is a widespread notion that there are many solutions to producing essentially the same motor output. One might be led to think that there is not great variability of output across animals or within animals, but a critical analysis of this question depends on strong data sets that compare patterns across levels from cells to behavior and across individuals in the same motor behavior. This paper does that for the heart beat rhythm in leeches. 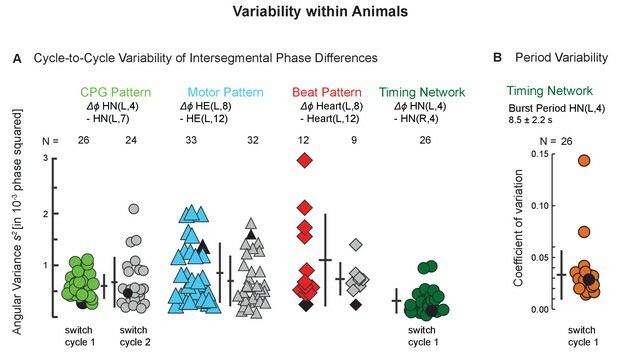 The major take home message is that, while there is relatively low variation in phase relationships on a cycle-to-cycle basis in a pattern produced by the heart circuit on one side of an individual animal, there is substantial variation at levels from CPG to behavior across animals. So, the output can be variable, though presumably still in an appropriately functional range. Importantly, even on opposite sides in an individual animal, the separate rhythm generators for heartbeat on the two sides can show as much difference as that seen between animals. This suggests that the assembly of the networks leads to differences in the motor patterns that may underlie observed variations. In short, rhythms across animals (and even within animals on the two sides) are not as consistent as we might think from cellular to behavioral levels, but one presumes that they are in a range that is good enough. This is important data for coming to grips with what variability at cellular and `molecular levels means for variability in motor behavior. Except for a few places the paper offers a clear verbal account and an especially clear graphical presentation of the data. 1) The Abstract is poor. I read it initially and could not really figure out what it was talking about. The paper itself is way better and the figures are excellent, but the abstract needs to be done in a way that makes the conclusions easily accessible to a person reading it. To be more concrete, in the parts starting on line 16, it is not obvious what repetition variability means, and the sentence after that one is also hard to parse without having read the paper. 2) I thought that the last two sentences of the subsection “Conclusions” seemed to be a side issue not appropriate for the big conclusions. 3) My biggest issue with the work however is the potential for variability that is the result of experimental manipulation necessary to collect the data. The preparations at some levels involve dissections and even some compression of the animal for imaging the beats. There is no account of how that might affect variation across preparations. Could the cross individual variation have to do with varying levels of damage to the preparations rather than a difference in the animals themselves. Even within an animal, the two sides might different because of some differences in the level of experimental damage within the two different networks that can still produce a stable output, but with a shifted phase. I am not sure exactly how to rule this out, but it seems to be something that deserves consideration in the paper. Is there is good reason to think it is not the source of the variation? And if it is, the paper may speak less to the construction of networks and perhaps more to their destruction. Thank you for resubmitting your work entitled "Output variability across animals and levels in a motor system" for further consideration at eLife. Your revised article has been favorably evaluated by Eve Marder (Senior editor), a Reviewing editor, and three reviewers, one of whom is a member of our Board of Reviewing Editors. The reviewers agree that is a fascinating paper demonstrating that the leech heartbeat system exhibits remarkable intra- and interindividual variability, and that variability is found at every level from the cellular to the behavioral level. As the authors state, variability across all levels is a hallmark of neuronal networks and behavior, and it is remarkable that even a small neuronal network with identified neurons and a known connectivity shows significant variability. The finding that each animal arrives at a unique solution of producing a heartbeat motor pattern, but that sometimes the intraindividual variability is larger than the variability across individuals is of general interest. The leech heartbeat system is an ideal system to study this topic, since it is not "stabilized" by sensory inputs. The analyses collected over many years provide a rich groundwork for not only the origins of, but also the implications for, variability in motor networks in general. 1) We appreciate the developmental angle as one possible explanation for the variability. The readership would benefit even more from this possible explanation, if the authors would better emphasize that homologous neurons arise from bilateral homologous neuroblasts. It's in there, but it is more alluded to than directly stated. It is a fascinating fact that bilateral neurons are not homologous but actually analogous. A finding itself that would be quite interesting for a general reader. If there is firm developmental evidence that these are, in fact, truly bilateral homologues then a more deliberate statement and citation of the evidence would go a long way to shoring up the "genetic/life history" hypothesis of the origins of the variability. 2) The very last sentence of the paper could more overtly place the charge on those model systems that are able to keenly control genetics and life history to take up the mantle of this idea next (I'm looking at you, Drosophila larval circuit people). If the Discussion/Conclusion section could draw from Drosophila or vertebrate literature in some way to show the groundwork for this charge, it would make for a compelling closing statement. Perhaps there is something in the recent beautiful work of the El-Manira group in zebrafish or Drosophila work by Landgraf or Pulver that isn't overtly discussed as variability, but to a trained eye has all the hallmarks. I'm not sure if there is fruit to be picked there, but if there were it would make a potent closing statement about where this foundational work could be extended to model systems with more "tools" at their disposal. There is also ample literature out there on gait variability and the clinical implications in the context of neurological disorders or ageing. There is also lots of mammalian literature that tries to decrease intraindividual variability with sensory stimulation. The authors have a great opportunity to emphasise the unique advantage of the leech heartbeat system in tackling this very relevant topic. For scientists working in mammals it is very perplexing that "even" in these small networks every animal finds its own solution to set up the rhythmic pattern. This is a fascinating take home message. 3) While we would like to ask you for a bigger picture discussion, the paper would benefit from reducing the Discussion section, by trying to make it more concise. We were not interested per se in cycle-to-cycle variability; we explore it here mainly to underpin our observations about differences among preparations, across levels, between episodic repetitions, and among bilaterally homologous neurons. We have not found corresponding studies in vertebrate rhythmic motor systems, except perhaps birdsong, which we made every effort to incorporate into Discussion section. We rely on extensive experimental analyses we have made over the years on the mechanisms of patterning within the heartbeat system and use this knowledge to inform our analyses. We have made an attempt to explore how variability can differ between levels with new analyses (Figures 5, 6 and Figure 5—figure supplement 1). Weaver et al., 2010, Wright and Calabrese, 2011 and Wright and Calabrese, 2011. We have scaled back our claims about pinpointing the sources of variability in the population (note change in Title and Abstract), and we speculate about the origin of bilateral variability in the Discussion section “This bilateral variability might arise from stochastic processes during development as envisioned e.g., in the models of O’Leary and Marder, (2013, 2014).” We think that the reviewer has been confused by our complicated ‘simple’ system. There are bilaterally paired hearts that are identical to the eye. They both perform peristalsis alternating with synchrony in a reciprocal manner; left heart peristaltic/right heart synchronous and vice versa. They do vary in the corresponding (peristaltic/synchronous) patterns they produce across sides (as they do among individuals) but there is no handedness that we can see. The nervous elements that control the hearts consist of bilaterally paired motor neurons and interneurons. These produce reciprocally switching peristaltic and synchronous patterns corresponding to the heartbeat. There is variability in the corresponding (peristaltic/synchronous) patterns they produce across sides (as they do among individuals) but again there is no handedness that we can see. The development of the leech nervous system has been studied in great detail and these studies suggest that bilateral homologous neurons arise from bilateral homologous neuroblasts. Symmetry is rampant in the leech nervous system. We have thoroughly addressed this issue and have added a figure (Figure 2) that fully explains all the groups of animals that we use and we constantly refer to this figure in the text to make sure that the reader know which animals we are referring to. All Ns in the manuscript refer to the number of animals (preparations). We now attempt to explain how variability translates from level to level and make new analyses to elucidate how known mechanisms of circuit operation may explain this translation of variability (Figure 5, Figure 5—figure supplement 1, Figure 6). We have completely rewritten the Abstract and hope it is clearer. We forthrightly address this issue in our letter of appeal. There is only ONE CPG network consisting of bilaterally paired neurons; if one side is messed up, the other is too. We clarified the operational definition of bilaterally homologous neurons in leeches and clarified our arguments about the stochastic nature of bilateral differences. We have now explored the literature for Drosophila, zebrafish, mice, and others and indicated where the potential exists for a meta-analysis of the type we have done (Discussion section). Indeed, the data are there (at least in the STNS, zebrafish, fly larval crawling) – but the variability across episodes and across animals have not been teased apart. We also extended the discussion on the mechanisms by which the variability in the motor pattern is reduced. This puzzling result [less variance in the motor pattern] begs the question how the variance of the motor pattern is reduced. The peristaltic phase difference that the HE(8) to HE(12) motor neurons achieve is significantly smaller than that of the premotor interneurons of the CPG (Figure 4 and Figure 5). The phase progression of the premotor bursting pattern determines the maximal phase range, but the segment-specific synaptic strength pattern, intrinsic properties, and coupling determines the phase realized between two motor neurons (Wright and Calabrese, 2011). The premotor phase differences and the synaptic strength patterns interact so that the phase difference of the motor neurons progresses smoothly across the segments, and this smoothing and segment-to-segment attenuation of the CPG phase difference may limit the variance of intersegmental Dfs, especially for nearby segments. In support of this conclusion, we observed that when a larger or smaller number of segments intervene between motor neurons are assessed, then the variance in the motor pattern reflects more or less the corresponding variance of the CPG (Figure 4—figure supplement 1). Thus, in segmentally distributed motor patterns (such as the swim networks of lampreys, fish, leeches, crayfish swimmerets and locomotor patterns in insects) it is important to define or, better even, to compare different sets of segments over which variability is assessed (Buschges, 2005; Grillner and El Manira, 2015; Ingebretson and Masino, 2013; Kristan et al., 2005; Mullins et al., 2011; Pulver et al., 2015; Smarandache-Wellmann et al., 2014; Wiggin et al., 2012). We provide a roadmap for others that may wish to analyze variability in motor system and argue that existing data sets on the locomotor and other motor patterns of invertebrates and vertebrates can be teased apart to determine the sources of output variability. We shortened the original discussion considerably but added back considerations about other systems. Cut about 10%. Dr. Anca Doloc-Mihu significantly improved the code to analyze spike-triggered averages and Florencia Zamora helped with the analysis. We would like to thank Dr. Mark A Masino for his comments on an earlier version of this manuscript. Supported by NIH NINDS 1 R01 NS085006 to RLC. © 2018, Wenning et al.